Back when I was a new gardener, I would rush to plant cool-season veggies as soon as it felt like spring outside, mostly because all the books said I could plant peas, potatoes, onions and cabbage "as soon as the soil could be worked in spring." If only it were that simple! Over the years I've learned of the many things that can go wrong in spring, from hungry rabbits to hail to howling winds, so I rarely plant anything this time of year without providing protection from the elements. Then there is the matter of cold soil. Some plants like garden peas will grow in cold soil, but they will grow faster and better in soil that has lost its chill. It's a happy coincidence that many easy ways to protect plants from stress also help warm the soil. Here are my top five ways to warm up cold garden soil so I can get going with spring planting: Solar-warmed water. Nature helps soil temperatures rise a little each day, but the process is set back by cold water, whether from rain or a watering can. 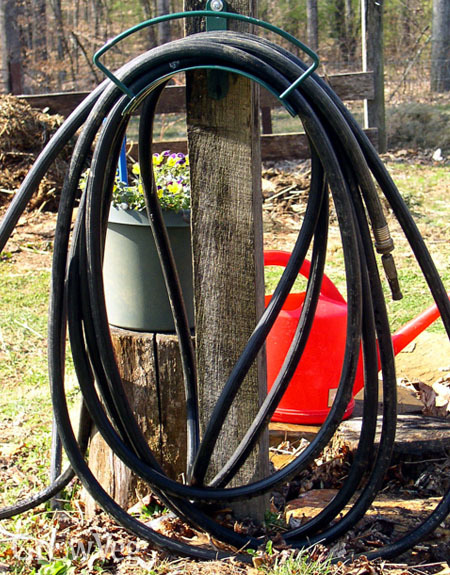 This time of year I use a black rubber hose stationed in the sun, which pre-warms water I will use in the garden. A large black bucket placed in a sunny spot can be used to warm up water, too. Plastic tunnels do a phenomenal job of capturing solar heat, but they must be ventilated or they will get too hot. Even with one end kept open, a low tunnel covered with sheet plastic will be ten to twenty degrees (Fahrenheit) warmer inside compared to outside conditions, with very little wind. Leafy greens love life under plastic tunnels, but only for a while. As days get longer and warmer, the heat accumulation under a well-ventilated plastic tunnel gets to be too much. Row cover (fleece) tunnels provide a safe transition for crops grown under plastic, plus they hide your veggies from insect and animal pests. I use a lot of row cover in the six weeks before my last spring frost, when the garden is filling up fast with cabbage, salad crops, and of course peas, potatoes and onions. It's easier and faster to tuck them in beneath a tunnel intended to provide temporary shelter from almost everything than to worry about all the little things that can go wrong. A cold frame kept closed is also useful if you are using the stale bed method to prepare planting space for weed-prone crops like onions and carrots. Every week or so, the inside of the frame is cultivated and watered to encourage the weed seeds hiding in the soil to germinate. Warm temperatures day and night inside the frame coax weed seeds to life promptly, so when the frame is moved and I plant the crop, there are fewer weed seeds present to give me trouble. Black plastic mulch increases soil temperature by about 3 degrees, but many organic gardeners (including me) are picky about plastic. I sometimes use a cornstarch-based biodegradable black film mulch, but it's not easy to find and prone to tearing. In his discussion of warming up soil, Ben Vanheems shows the opposite approach – using a heavy thickness of black plastic, which can be reused for several seasons if handled with care. Film mulches must be securely tucked in along all edges, but once installed they warm the soil and block out weeds. Frogs Like Warm Soil Too! Don't be surprised if the same warm spots you provide for plants attract other life forms that are eager for spring. Often I see my first toad of the season using the cold frame as a sauna, complete with toad snacks as warm conditions trigger insects to move up to the soil's surface. This is an aspect of gardening that should not be swept aside, because getting friendly with frogs is a veggie gardener's version of stopping to smell the roses. "Would not warm tap water or ran collected do the same? Temp at ?" "Yes, you are right: warmth is warmth. I think lukewarm water is best, the main point being to avoid cold water when you want to encourage soil temperatures to rise."